The talk will be in the Hardman Jacob Learning Center, Rm. 125 at 5.15 on 11.7. Ramiro Gomez was born in 1986 in San Bernardino, California to undocumented Mexican immigrant parents who have since become US citizens. He briefly attended the California Institute for the Arts before leaving to take work as a live-in nanny with a West Hollywood family, an experience that did much to inform his subsequent artistic practice. Gomez’s work is known for addressing issues of immigration and making visible the “invisible” labor forces that keep the pools, homes, and gardens of Los Angeles in such pristine condition. In 2013 Gomez had his first solo exhibition at the UCLA Chicano Studies Research Center, and was also awarded with a residency to install a mural in West Hollywood Park, a project titled The Caretakers, which remains on view. In 2014 Gomez had his solo gallery debut at Charlie James Gallery in Los Angeles, and went on to show widely across North America. In 2015 Gomez exhibited at the University of Michigan Institute for the Humanities, the Chicago Humanities Festival, and again at Charlie James Gallery. In the spring of 2016, Gomez had his third show “On Melrose” at the Charlie James Gallery in conjunction with the publication of a monograph on his work by Lawrence Weschler (Abrams), titled “Domestic Scenes: The Art of Ramiro Gomez”. Gomez participated in the 2017 Whitney Biennial as part of Raf Esparza’s “Figure Ground: Beyond the White Field” installation. His work was also included in three of the Getty’s Pacific Standard Time: LA/LA exhibitions – “Home—So Different, So Appealing” at the Los Angeles County Museum of Art (LACMA), a joint show, “In West Hollywood” at the West Hollywood Library with his partner, David Feldman, and the Chapman University exhibition “My Barrio: Emigdio Vasquez and Chicana/o Identity in Orange County”. In August 2017, LACMA announced their acquisition of one of Gomez’s works, Cut-Outs (2015), into their permanent collection. Cut-Outs is a full-room installation of acrylic-on-cardboard panels and sculptures which Gomez started during his residency at Institute for the Humanities Gallery at the University of Michigan in 2015. Gomez has exhibited at the Smithsonian National Portrait Gallery, LACMA, Denver Art Museum, MFA Houston, Nerman Museum of Contemporary Art, Torrance Art Museum, Cornell Fine Arts Museum, MCA San Diego and Museum of Latin American Art (MoLAA) among many others. Gomez’s work has been covered in the Atlantic, the New Yorker, New York Times Magazine, the Washington Post, NPR, the Los Angeles Times, Hyperallergic, Huffington Post, and CNN among others. Gomez lives and works in West Hollywood, California. 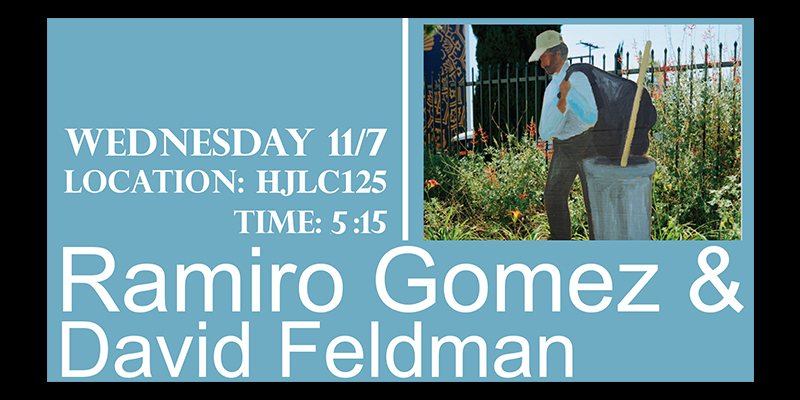 This entry was posted in 3D, Lecture, NMSU Department of Art, Visiting Artist and tagged #davidfeldman, #nmsuart, #nmsuartdepart, #ramirogomez, #visitingartistandlectureseres, NMSU. Bookmark the permalink. Follow any comments here with the RSS feed for this post. Both comments and trackbacks are currently closed.